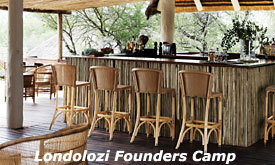 Enchanting and intimate, Londolozi Founder’s Camp is ideally situated to provide an insider’s view of the secrets of river life. 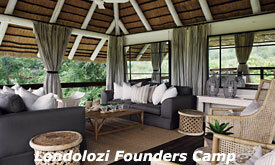 Seven idyllic chalets, repose in the shade of ancient ebony and matumi trees along the banks of the Sand River. 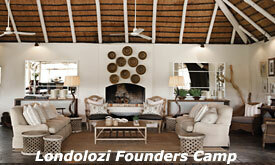 Londolozi’s exciting safari activities: Renowned for its exceptional African wildlife and leopard sightings. 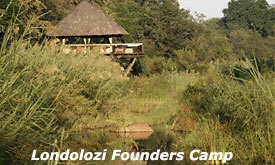 Experienced rangers and trackers will lead you on morning and afternoon/evening game-drives in open 4x4 safari vehicles. 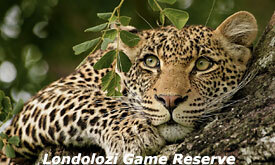 The Sabi Sand Game Reserve and Kruger National Park are of the finest Big Five game (lion, leopard, elephant, buffalo and rhino) destinations in Africa and you stand an excellent chance of spotting the elusive leopard. 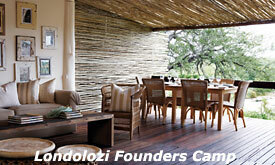 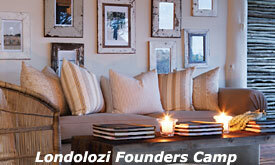 Londolozi is renowned for its world-class rangers and Shangaan trackers who are regarded as among the best in Africa.